Note, if you are a first time Gerrit user, please take a look at the Setting up Gerrit page. 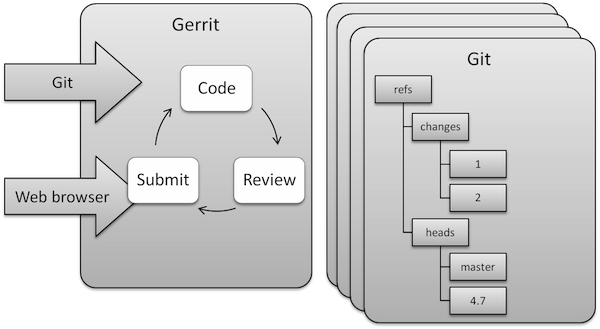 Gerrit is a web-based tool that is used for code review. Its main features are the side-by-side difference viewing and inline commenting, which makes code reviews a quick and simple task. It is used together with the Git version control system. Gerrit allows authorized contributors to merge Changes to the Git repository, after reviews are done. Contributors can get their code reviewed with little effort, and get their Changes quickly through the system. 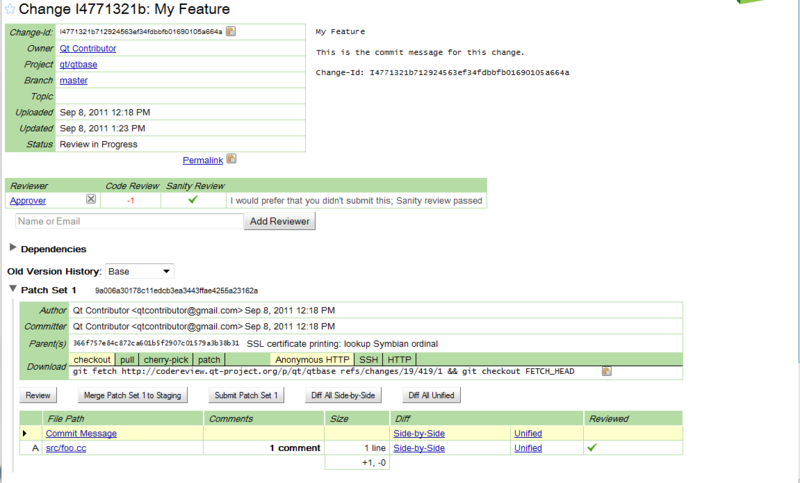 Gerrit can manage multiple repositories (projects). Branches are fully supported by Gerrit, each repository can have any number of branches. Gerrit stores Changes, which are normal commits, as references in the refs/changes/ namespace. When contributors push Changes, they prepend refs/for/ to the target branch. For example, when contributor uploads a commit to the dev branch, the target ref will be refs/for/dev. Change The unit of review. Results in a single commit when merged to the Git repository. Change numbers (identifiers) are unique and never change. Patch Set A revision of a Change. Each time a Change is modified, it will receive a new Patch Set. Patch Set numbering starts from 1. Technically, a Patch Set is a unique Git commit. Approval Category Name for a scope that is checked during review process. 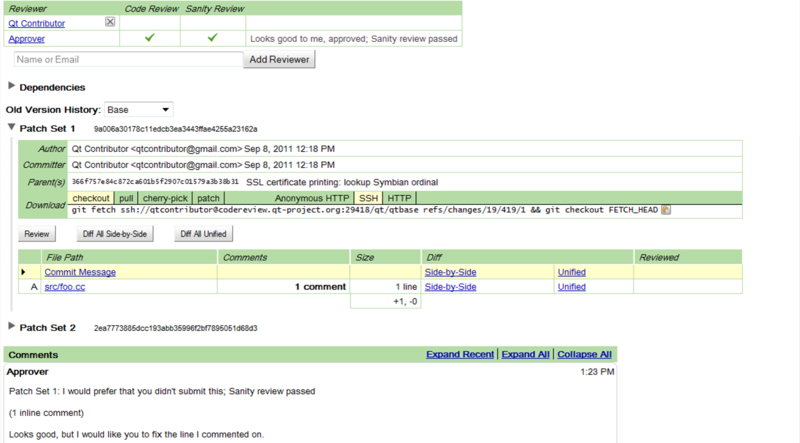 Qt is using the categories Code Review and Sanity Review. Score A value in an Approval Category. Indicates if a Change is approved and can be submitted to the Git repository. Submit An action that allows Gerrit to merge a Change to the Git repository. Abandon Action that archives a Change. An abandoned Change can be restored later. Before any contribution can be created, a Git clone of the target repository must be obtained and properly configured. The necessary steps are explained in Setting up Gerrit. See the Git Introduction to get started. If you correctly set up the clone, the commit message editor will present you with a template for the message. The guidelines for creating good commit messages - and creating good commits in general, for that matter - are outlined in the Commit Policy. On initial creation of a commit, if the commit-msg hook is set up properly, an additional line in the form of "Change-Id: …" should have been added. Changes are pushed to Gerrit with git push. Note that a special target ref is used. Gerrit reports how many Changes were created and provides links to these Changes. 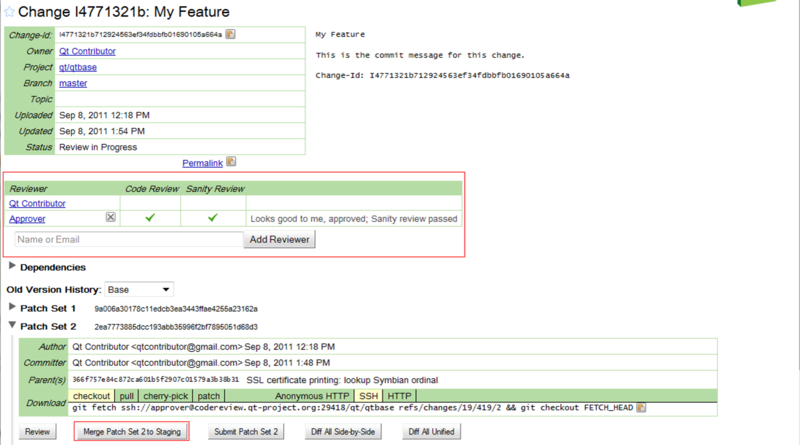 When pushing to Gerrit, a typical refspec uses HEAD as the source ref and a special Gerrit ref for the target branch. The target ref has the format refs/for/<branch name>. Pushes to this target ref causes Gerrit to create new Changes for all commits pushed this way. To group your Changes, push to a topic by using the format refs/for/<branch name>/<topic name>. Note that it is possible to use any other ref as source ref instead of HEAD when necessary. See Branch Guidelines to decide about the target branch. The contributor requests feedback by adding reviewers to the Change. This is typically done via the web browser. Access the Change with the web browser and use the "Add Reviewer" button to add any other registered user(s) to the review. It is possible to find Changes by issuing search queries. Links for the Change owner, project name and branch name in the search result listings can be used to quickly search for related Changes. The navigation bar at the top of the Gerrit web view provides quick access to common search queries under the "My" and "All" items. The review process starts with choosing a Change to review. 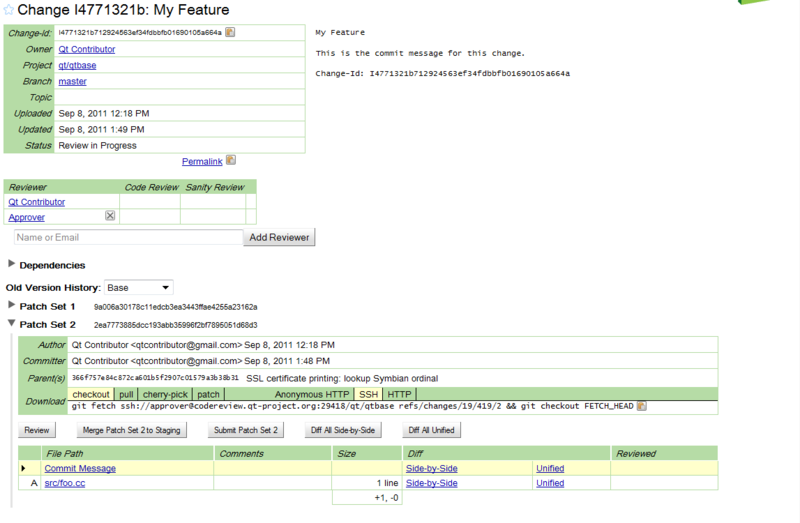 After choosing a Change, changed files can be viewed side-by-side and comments can be posted in-line to each file. Contributions are typically reviewed by Approvers, but anyone can make a review. Changes can have several Patch Sets. When Changes get updated after review, the Patch Set number increases. Changes are compared side-by-side or in the unified diff view. The reviewer can also compare differences between specific Patch Sets (also called "inter-diffs"). Comments are posted by double clicking on a line. Comments are saved as drafts until they are published. Note that comments are formatted as flowed text, discarding individual line breaks. A simple Wiki-like syntax is supported. Gerrit keeps track which files have been reviewed and which files have comments ready to be published. If an ongoing review is interrupted, the reviewer can return later and resume where they left off. Draft comments can be edited and deleted before they are published. This makes it possible to use the usual git commands to view changes, to build the code, and to run tests. 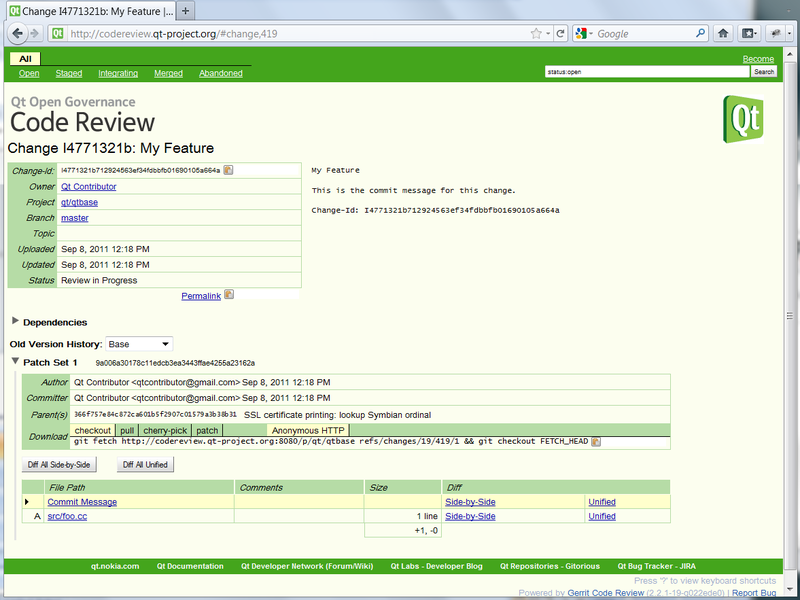 When all files are reviewed, the reviewer continues to the Publish Comments screen with the Review button. The review is completed by writing an optional cover message and giving a score. The cover message uses the same Wiki-like syntax as inline comments. The Code Review category has 5 levels. A Change can only be submitted after it receives a +2 score, and cannot be be submitted if it receives a -2 score. Giving these scores is limited to Approvers; regular contributors can give only advisory scores (-1 to +1). A Sanity Review score should not be given unless the Sanity Bot made a mistake and needs to be overridden. An alternative to browser-based review is to use the Gerrit ssh command line interface. Please do not do this, as scripting a step which is meant to be visual and interactive removes the additional safety net. The contributor can view feedback on their contributions by accessing the Change page and reading comments file-by-file. 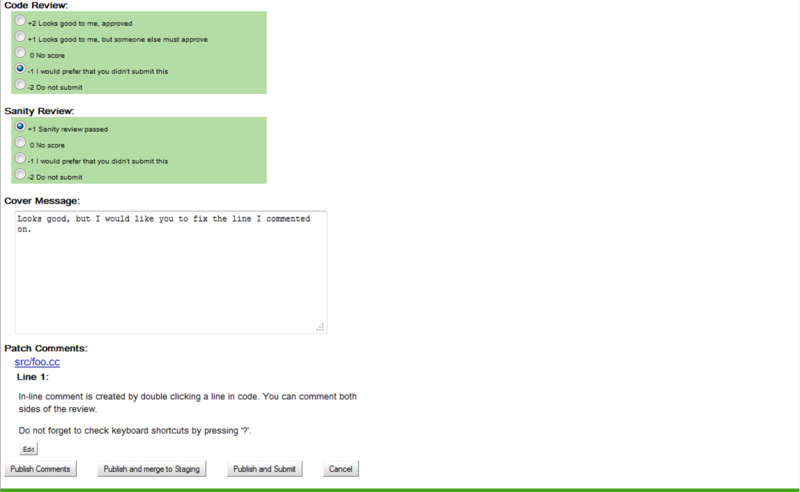 It is possible to reply to comments and have a discussion about the code review in-line. Note that the comments are not actually posted until you publish them. Note: do not reply to the notification mails you get from Gerrit. The mails you send this way will not be publicly visible and archived. Most Changes require multiple iterations of the review process. The contributor needs to update the Change if it received some comments that require action, or it did not merge with the branch tip. Each time a Change is updated, it gains a new Patch Set. Note, that in contrast to github, bitbucket, gitlab etc., in Gerrit the change under review is a single commit. (In github etc. the review is about whether to merge the feature branch into master, in Gerrit the review is about whether the commit should be accepted into master.) So in order to change the content of a review, there must be a single new commit that contains everything you would like to review. This is not "rewriting public history" because the commits under review are not (yet) part of the "public history" -- only after they are accepted, they become part of the projects history. The following sections explain how to create a new commit that is suitable to replace the old commit for the review. If the original commit(s) are still available, it is possible to amend them right away. Otherwise, download the Change(s) the same way as for local review. If you are not using a separate branch, you can just use git pull --rebase. Note: Please do not rebase unnecessarily, as this makes inter-diffs much less useful. Modifications in the working tree are committed with the --amend option. If the contribution consists of multiple commits, you will need to use git rebase --interactive to revise earlier commits. When you amend commit messages, make sure to preserve the Change-Id footer, as this is how Gerrit identifies new Patch Sets for existing Changes. Pay even more attention to copying the Change-Id when you redo commits from scratch. Writing objects: 100% (4/4), 419 bytes, done. There are two ways to submit a Change. If the project is using a continuous integration system, Changes will be merged to staging. Otherwise, they will be submitted directly to their destination branch. 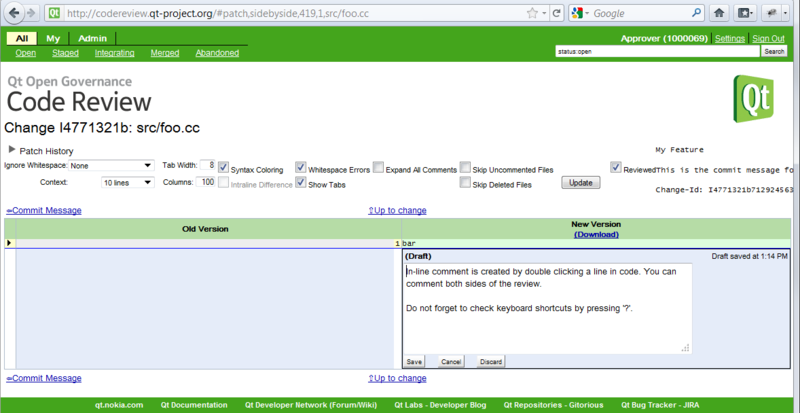 To submit a Change to the CI system press "Merge Patch Set <n> to Staging". To submit a Change directly to the target branch press "Submit Patch Set <n>"
It is usually best when the contributor submits their own Changes. Even if there are multiple reviewers, only one +2 approval is required. However, if other reviewers have shown a specific interest in a contribution, such as by repeated comments, it is polite to give them some time to add a +1 or +2 before submitting. See the Review_Policy for more details. Gerrit has been slightly customized for the Qt project. The continuous integration system that is running regular builds and tests has been incorporated to the workflow. Instead of directly submitting Changes, Changes can be merged to a staging branch. There is a staging branch for each normal branch. Staging branches are maintained by Gerrit and are not visible to the contributors. As part of the customization, Changes gained new states. Changes in the New state are waiting for a review. After review, Changes are merged to a staging branch and marked as Staged. The continuous integration system will pick staged Changes at regular intervals and move them to the Integrating state. From the Integrating state Changes are either submitted or moved back to the New state. If builds succeed and tests pass, the Changes are submitted or merged into their destination branch. Otherwise they are moved back to the New state for further analysis. The contributor of the affected Change(s) is expected to analyze the failure and upload fixes as necessary. Changes which are inherently flawed or became inapplicable should be abandoned. An abandoned Change will disappear from open Changes lists and is considered closed. Abandoned Changes can be restored later if they become valid again or if they were abandoned by accident. Changes which have potential but will not be worked on in the near future should be deferred. Deferred Changes are basically abandoned, but are more easily accessible via the "My Deferred Changes" menu item. Abandoning is a normal operation that is used to maintain Gerrit and hide Changes that will not make their way to the Git repository, for any reason. The Qt Project's handling of branches is documented by the Branch Guidelines. Gerrit topics can be used as "feature branches". A topic is created when a target ref like refs/for/<branch name>/<topic name> is used. It is often good enough to push a set of commits for review to a topic. However, if the contributor intends to work with others on a long-living branch, the Gerrit Administrators should be contacted for a new branch in Gerrit. Also, the QA team has to be contacted so they can include the new branch in the CI system builds. This way the code can be reviewed already when working on it in the branch. Merges between feature branches and the mainline are like all other commits and are pushed, reviewed and staged the usual way. However, only 'Merge Masters' can push merge commits. User may recruit the merge master from outside project team if it they do not have person knowledgeable on Git available. Note: Do not create a merge from commits which have not been integrated yet. This should not happen often. Nevertheless, only a merge commit should be pushed in this case. 'Push Master' can be asked to import the branch into Gerrit. Take care to make subsequent pushes of the change to the new branch, as otherwise a duplicate will be created. If something goes wrong (typically, you are not the Change's owner, or a conflicting Change exists), ask a Gerrit Administrator to deal with the issue. There is a process for requesting new repositories. Report bugs in our Gerrit to the bugtracker. Ideally, provide a link to an upstream issue (note that the issue may be already closed, as we are typically lagging by several versions). This page was last modified on 13 December 2018, at 14:02.